Sometimes wearing motorbike boots feels a little rebellious. I remember, as a student, working at a university graduation ceremony and noticing that a lecturer I knew fairly well had a pair of boots on beneath his academic gown, jeans tucked in at the shin. It didn’t bother him in the slightest (the fact his battered Triumph baseball cap was still on his head gave that away). For many of us, this devil-may-care attitude won’t fly, either in our minds or in the minds of our bosses but there is a solution out there – urban motorbike shoes. These are designed to look like regular shoes or trainers but have enough protection built in to protect you around town. In many ways, they’re like Kevlar jeans, but for your feet, containing a similar set of compromises. 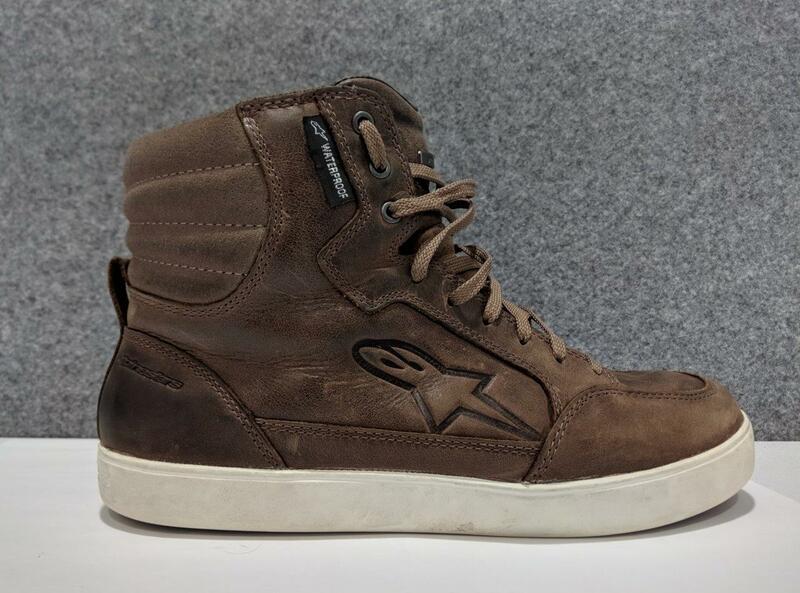 The Alpinestars J-6 shoes I have worn for over a year now are of a suede leather construction and come in brown with a cream sole or a fully black version which, when worn with bike gear, look more like traditional boots. They have been completely waterproof, despite the lack of a coveted Goretex or Drystar label, and carry the CE level 2 protection mark. Read on to find out more. To anyone not familiar with motorbike gear these boots look just like any normal pair of short boots out there, the fashion equivalent of a high-top trainer or a particularly strong looking pair of Converse! 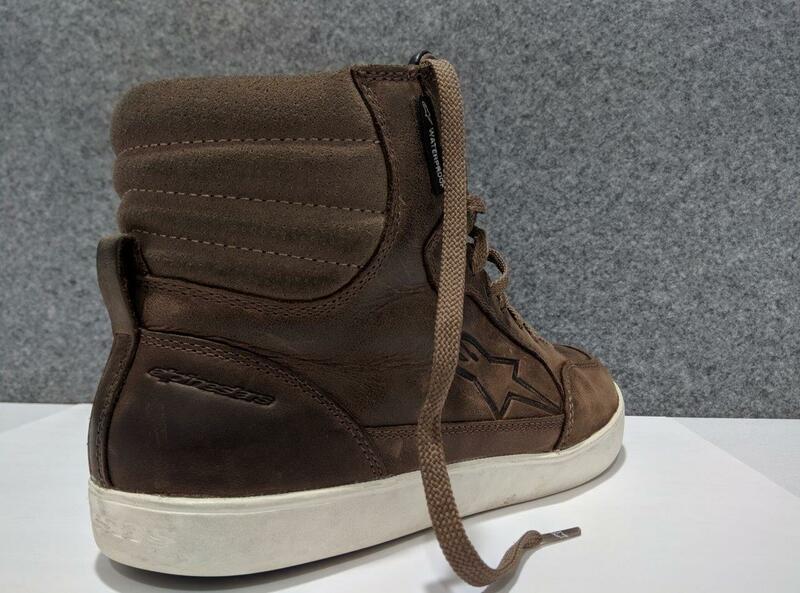 Look closer though and the details show that Alpinestars put a fair amount of thought into making this boot at home both on your bike and also on the streets too. 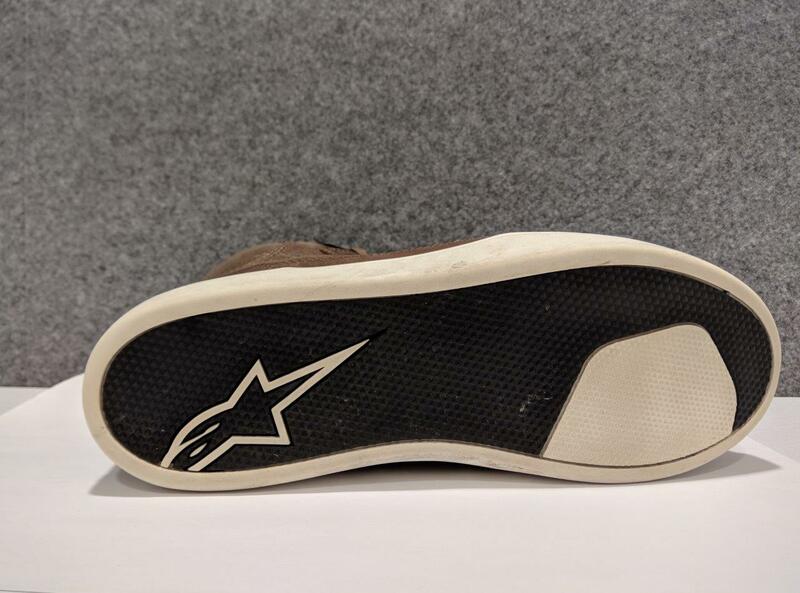 The flat sole has the Alpinestars logo molded into the soft rubber, the tongue of the boot is padded to protect the front of the foot in an impact and has a small brass tag, about an inch across on the top with the name of the brand. 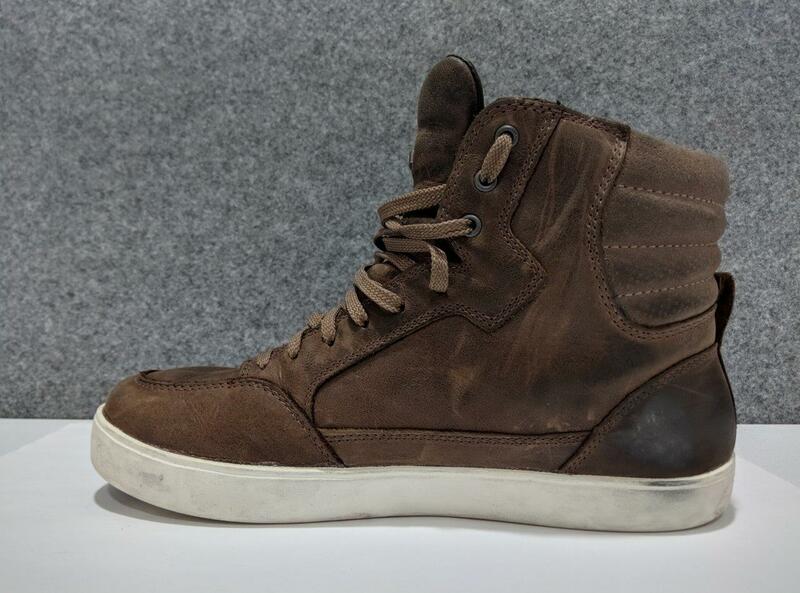 On the side of the shoe, the Italian company’s logo is again present, it being embossed into the leather. It’s all quite subtle but very stylish and gives an inkling as to the quality contained within. 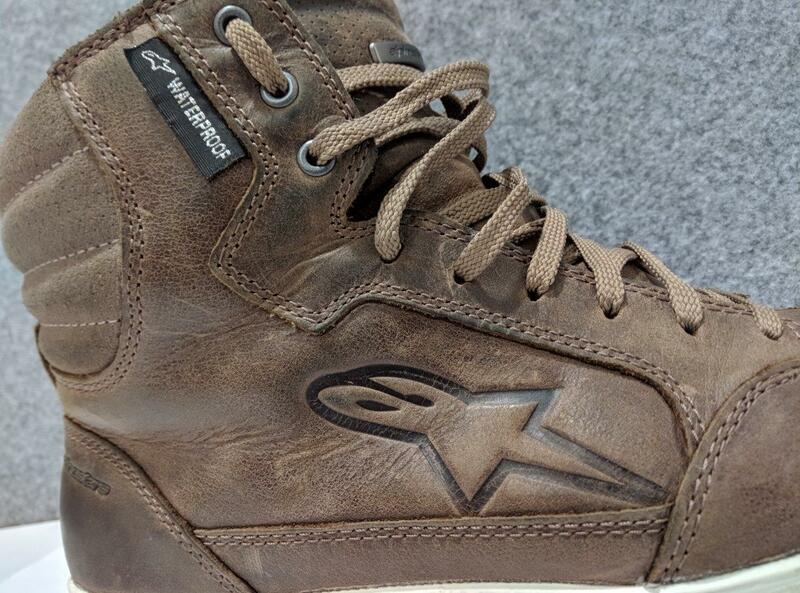 Alpinestars have a reputation for making quite narrow fitments in their footwear but I didn’t find this to be the case with the J-6. I found them to be true to size and they have remained so, stretching only by a small amount. They fit as well now as they did when I was smitten by them in the shop. 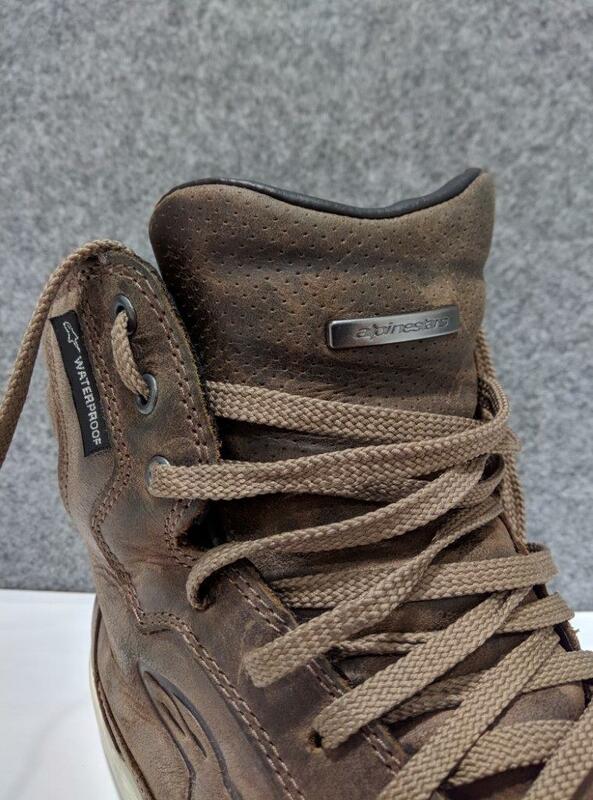 I remember tying the laces when trying them on in the shop and noticing how the boot felt just like the most comfortable pair of casual shoes I had ever owned. Even the laces themselves seemed to be high-quality items, threaded through brass eyelets which have become polished with their use over time. It has not all been rosy in the garden though, my right foot used to become quite sore around the arch area but this occurred with any other flat shoes I have. Changing the insole to a gel one helped for a while but it’s still something that bothers me from time to time and I don’t think I can blame the boot for this. Indeed, if I were to go out for a long walk and wanted a really comfortable shoe I tend to pick these up. 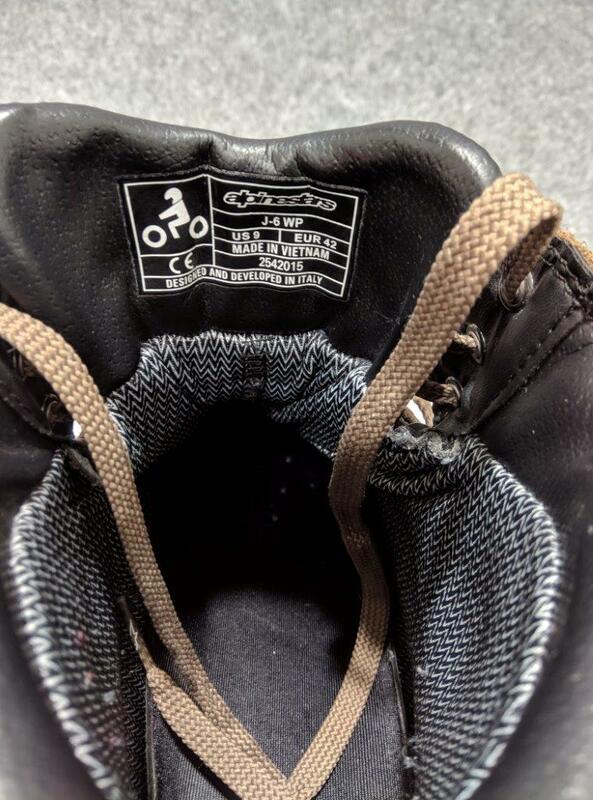 When was the last time you could say that about any bike boot? As such, I reckon it deserves the full 100% for comfort and fit. It’s great that the boots are comfortable but without the construction and safety credentials to back it up, I could never recommend them. While researching this article, and closely examining my own pair of these, I’ve learned that the ankle and heel protectors are actually placed between the upper leather and the fabric padded interior of the boot. They’re practically invisible and you don’t feel them when putting the boots on or taking them off. Again, they just feel like regular comfy shoes. Underneath the foot, and above the sole of the shoe, there is another protector, these all contributing to the CE level 2 rating of the boot in the CE EN 13634 category that defines protection against abrasion, energy absorption of an impact etc. Despite the good safety rating, I’m pretty convinced that I would rather have my full sized TCX S-Sport boot on rather than the Alpinestars J-6 if I were to be involved in an accident. I can really feel the protection of the TCX boot, partly because it does constrict some of my mobility, while the Alpinestars boot is so subtle as to make you forget that there is any protection built in at all. That being said the TCX boot is a dedicated motorbike boot while the J-6 is not as dedicated to that one objective and so has to maintain comfort as well, which it does brilliantly. You can ride all day in these boots and then walk for miles in them without becoming sore (apart from my foot arch issue above which is probably unrelated to these boots). I wear them as casual shoes in the office after riding in through the daily traffic. They fit in with the “smart casual” business attire that many offices abide by these days and in most of the weather, they don’t cause my feet to feel like they’re being boiled in their own sweat. Perhaps the most important thing to me when shopping for a pair of these casual boots was the need for them to remain properly waterproof. I never expected these, equipped with an unknown membrane as opposed to Goretex or Alpinestars proprietary Drystar membrane, to keep out the Irish rain. However, these have kept out every drop. Granted I ride a faired motorbike with some protection from the fairing for my feet but over the last 15 months not one drop of water has managed to get into these boots. Truth be told, it still amazes me! I do tend to apply some leather conditioner to the upper of the boot from time to time to keep it looking well but even without that, I am confident that they would remain bone dry inside. The little “Waterproof” tag on the side of the boot certainly means just that on the J-6. There was one thing I had to bring up – one of the soles squeaks. Every time I walk in the office on a hard surface the left boot lets out a quiet squeak. Once, having not worn them for nearly a month due to me being off of the motorbike for surgery, I returned to find the squeak had gone so I wondered is it that there is a small bit of moisture trapped in the sole which had dried out by then. It hasn’t been there since the start, only occurring about 7 months into owning them, and that left boot is on the ground more than the right foot [the left boot always goes down to the road at traffic lights and such], so the moisture theory might hold true. I tend to wear shoes out quite quickly but this, and a left sole wearing unevenly compared to the right, a trait I manage to maintain across all of my shoes, are the only signs that the boot is the age it is. No loose threads either. I went into the local motorbike dealer, Lee Honda, to see their small selection of casual boots and intent on picking up a cheap pair for use around the city in the summer sun. Instead, the salesperson/parts-guy/worker showed me these Alpinestar J-6 boots. He happened to be wearing a pair himself and said that they were fully waterproof and so comfortable he wears them around the house. Considering they were double the price of the Richa pair I had been eyeing up I immediately thought he was going for the upsell. I’m glad I tried the pair of them on though because they’ve proven to be all he said they were. If you’re in the market for a good short casual motorbike boot these should be the ones you try first. The post Alpinestars J-6 Waterproof Riding Shoes Review appeared first on Web Bike World.